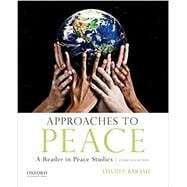 Approaches to Peace: A Reader in Peace Studies, Fourth Edition, provides a unique and interdisciplinary sampling of key articles focusing on the diverse facets of peace and conflict studies. Featuring both classic and contemporary work, it enables students to read highly influential articles while also introducing them to the most current perspectives in the field. Timeless classics from Leo Tolstoy, Martin Luther King, Jr., Gandhi, and Henry David Thoreau are included alongside contemporary pieces by illustrious contributors including Noam Chomsky, bell hooks, Vandana Shiva, and Pope Francis. David P. Barash is Professor of Psychology at the University of Washington. He is the author of more than thirty books, including Out of Eden (OUP, 2016), Buddhist Biology (OUP, 2013), and Homo Mysterious (OUP, 2012). Each chapter ends with Study Questions and Suggestions for Further Reading. Chapter 2. Building "Negative Peace"
Chapter 4. Building "Positive Peace"
Letter from a Birmingham Jail: Martin Luther King Jr.
Soft Power: Joseph S. Nye Jr.